Boyan Slat has a $360 million plan to clean the ocean using the sea's natural currents. Critics say it's not that simple. Viral videos show whales ensnared and sea turtles choking. Studies find some 70 percent of seabirds have ingested the waste. And a photo recently revealed that plastic has found its way to even the deepest reaches of the ocean. Straws, forks, shopping bags, nets and all manner of human detritus seems to be everywhere in what was once the endless, unspoiled sea. The world has signaled its alarm with a wave of countermeasures: Several American cities have banned plastic straws. Chile this spring joined a growing list of nations forbidding single-use plastic bags. In late May, the European Commission directed its 28 member nations to outlaw throwaway plastics, in what one official called a “global race” to slow the synthetic tide. 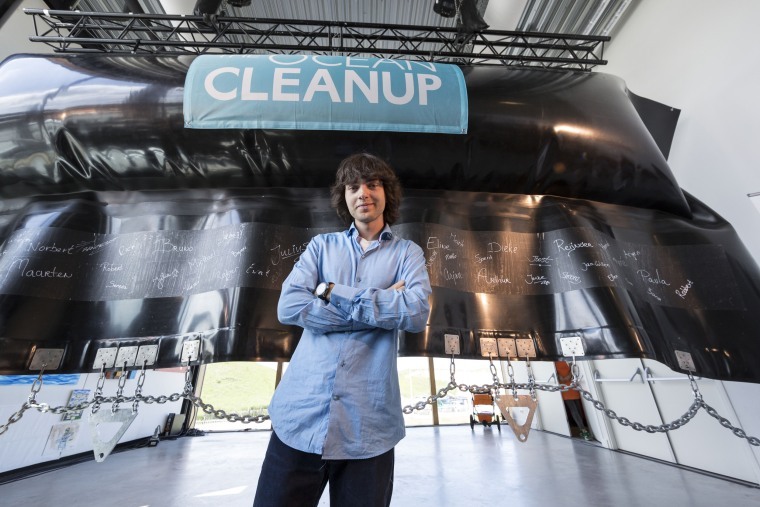 And now, an audacious young Dutch inventor named Boyan Slat and his 70-member team have entered the final preparations for a mission to deploy an experimental device they say can capture much of the plastic that fouls the world’s oceans. A model of Slat’s unique plastics dam passed a crucial trial run in the Pacific Ocean last week and returned to its home base in San Francisco Bay. Days later, the Ocean Cleanup Project said it had won a green light from the Dutch government to conduct operations in international waters. And this week, Slat plans to unveil progress on the first prototype of his invention to reporters in Alameda, California, showing off the ungainly, 2,000-foot-long floating screen that is scheduled to be towed into the ocean before Labor Day. Can this giant cleanup device save the ocean? Its target? The Great Pacific Garbage Patch, the largest of multiple rotating ocean “gyres” that attract waste like giant drains. The Pacific gyre is a sprawling witches’ brew of man-made flotsam, lost fishing gear and invisible plastic particles, stretching across an area three times the size of France. The Ocean Cleanup seemed big, brazen and bound to struggle when it was introduced in 2016 to Rick Spinrad, an oceanographer who was chief scientist at the National Oceanographic and Atmospheric Administration. “But the more I dove in and got more and more detail, the more I changed my mind,” said Spinrad, now a professor at Oregon State University. “They are doing a very thoughtful well-designed process to get to where they want to go. That is why I am convinced they are going to have some success.” Just how much success, he said, remains to be seen. The Ocean Cleanup’s profile has been elevated by its media-genic founder and leader. Uncannily confident, Slat used a TEDx talk in 2012 in his native Netherlands to announce that a solution to one of the world’s most intractable environmental problems was within grasp. He would solve the problem. He was 18 years old. Now, six weeks shy of his 24th birthday, Slat still thinks he has the answer. And he has been persuasive enough to win praise from kings and prime ministers, rock stars and the United Nations. He also has drawn a cadre of persistent critics, who say his plan is directed at the wrong end of the plastics life cycle and could harm the very sea life it is meant to protect. Slat’s TEDx talk, delivered in his hometown, Delft, won him growing acclaim. In the video, he described how he believed plastic could be collected by harnessing the ocean’s most powerful forces — currents and waves. The TED video drew more than 2 million views. In its immediate aftermath, Slat got thousands of emails urging him on. Then a freshman studying aerospace engineering at the Delft University of Technology, he felt he couldn’t continue in academia and pursue ocean cleanup at the same time. His father was a Croatian artist and his mother, who raised him, a Dutch-British consultant for foreigners relocating to Holland. Boyan’s tinkering began at age 2 and he was soon building treehouses and ziplines and experimenting with explosives. In his early teens he tried to remove moisture from ammonium nitrate, using the family stove. He triggered an explosion and a caustic fog. He asked himself why such pollution couldn’t be cleaned up. “I couldn’t really stop thinking about that,” he said. The question became a school science project, which launched a mission. Slat originally envisioned one massive boom, more than 60 miles long, blocking trash in the middle of the gyre, with ships arriving occasionally to haul away the mess. That has evolved into a plan for multiple “arrays,” each consisting of a pipe-shaped float — sixth tenths of a mile to a mile in length — with a 10-foot-tall screen of impermeable synthetic textile hanging beneath the surface. The crescent-shaped screens are supposed to allow sealife to swim under or around. A drift anchor, dragging in deeper and slower sub-surface currents, is intended to slow the screen enough for it to trap plastic forced into the crescent by the faster currents along the surface. A ship would then be dispatched every few weeks to scoop up the waste and deliver it to a recycling center. If the initial operation succeeds, Slat envisions corporations and individuals sponsoring future screens. With an estimated cost of nearly $6 million per screen, a total of $360 million would be needed to sprinkle the Pacific garbage patch with 60 strainers. The price tag is forecast to pay for construction and three years of operations, with planners hoping the sale of recycled plastic will finance the project beyond that. Silicon Valley venture capitalist Peter Thiel’s foundation found Slat online and made him a “Thiel Fellow,” which begins with a $100,000 grant to help young entrepreneurs pursue their dreams. Another tech magnate, Salesforce.com CEO Marc Benioff, tweeted his interest in the cleanup and later became one of its biggest backers. Some scientists and environmentalists are not so sure. "This has got to be resolved on land, rather than in the water." The conservancy is focused on solutions that cut plastics off at the source, banning single-use items or blocking plastics “upstream” on rivers and other points where trash spills into the ocean at an estimated rate of 8 million metric tons a year. “This has got to be resolved on land, rather than in the water,” Leonard said, otherwise cleanup crews will face the “Sisyphean task” of removing ever-greater volumes of new plastic. The Ocean Cleanup researchers said their aerial and shipboard studies in the Pacific have shown the majority of the plastic pollution lies near the surface, where the device can scoop it up. But the National Oceanographic and Atmospheric Administration’s Marine Debris Program emphasizes that the pollution “is not only located on the water’s surface, but throughout the water column and all the way down to the ocean floor” — out of reach of Slat’s device. Slat’s team also faces questions about whether organisms — from plankton to whales — will be captured or disturbed by the giant scrims. The same with ships: Will they be able to steer clear of the lumbering screens? And if storms break up the giant collection booms will that “just create another giant floating marine debris?” asked Kim Martini, a physical oceanographer trained at the University of Washington. Engineers at Ocean Cleanup headquarters in Delft think they have the answers. A ship with independent monitors will be stationed for six months beside the first installation, scheduled for September, to monitor the impact on sea life. And the screens will be outfitted with night lights, radar reflectors, electronic-identifying signals and GPS — all of which Slat’s team believes will make the systems easily detectable in an area they say is fairly light on shipping, anyway. And, as to potential mechanical collapses, the giant pipe is broken up by bulkheads, to prevent one flooded section from dragging down the whole apparatus. Once the first full-size screen has been assembled in a couple of months, it will be ready to be eased into San Francisco Bay, towed under the Golden Gate Bridge and into the Pacific. The Ocean Cleanup crew will unleash what Slat calls an “entirely new machine” about 250 miles offshore, to check its performance. Then it will be an 800-mile voyage to the heart of the Great Pacific Garbage Patch. “He works on it whenever he is not sleeping."